Using different camera software can definitely help you take better shots on your iPhone, but there's a limit to what you can do with an app. Sometimes, to get a better photo you need to purchase a better lens—and fortunately there are a few companies that have come out with some truly excellent options. Here are five of the best add-on lenses for your iPhone 5 or 6. When it comes to versatility, it's hard to go past the OlloClip 4-in-1 Photo Lens. It's available for iPhone 5 and iPhone 6 models, and although both versions include the same types of lens, they work slightly differently. Attaching to your phone via a clip-on mechanism, the OlloClip offers wide-angle and fisheye lenses out of the box. Unscrew either one, however, and you'll be presented with either a 10x or 15x macro lens as well. The iPhone 6 version works with either the front or back cameras, while the earlier model is just for the primary (back) camera. The latest version also includes a pendant to wear the OlloClip around your neck when you're not using it—much easier than taking it out and packing it away all the time. Image quality is extremely good, with independent reviews praising all four lenses. The OlloClip 4-in-1 is a genuine enhancement to what was already a very good smartphone camera, at a good price. Available for iPhone 5/5s and iPhone 6/6 Plus. One thing that OlloClip's 4-in-1 model lacks is a telephoto option. Zooming in with a smartphone camera is usually a bad idea, since it's done in software and you end up with a low-quality result. Using a physical zoom lens, however, gives a far better photo. OlloClip's Telephoto lens provides a 2x zoom, which isn't all that much—but the results are surprisingly good unless you're trying to get closeups of distant objects. It's ideal for portrait shots, letting you get nice and close to your subject without standing right up in their face. It also includes a removable circular polarizing lens (that's the CPL part), which helps reduce glare and keep colors accurate. Available in iPhone 5 and iPhone 6 versions. Again, the latter version works with both front and back cameras, and includes wearable pendants. One thing to note about OlloClip lenses is that they won't fit over your existing iPhone case. 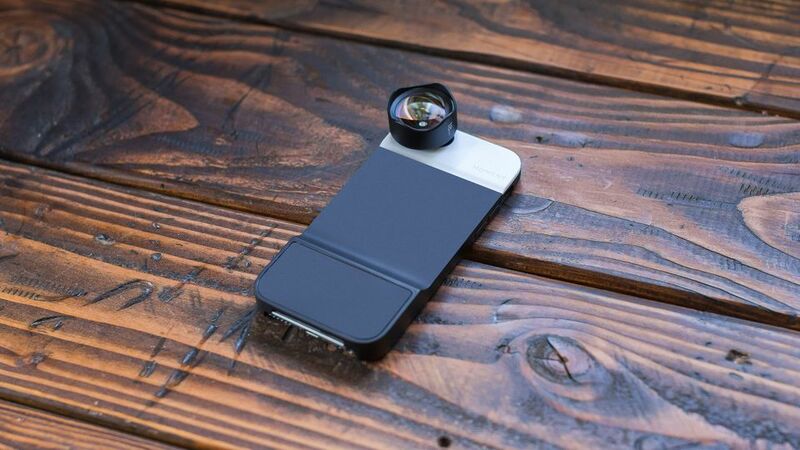 If you want to still use a case, you'll need to buy the OlloClip versions which include a cut-out for the lenses. Most well-known for its range of quality camera gear, Manfrotto has also released a multi-lens solution for iPhones. As well as three lenses—fisheye, 1.5x portrait and wide-angle—you'll also find a plastic case, wrist strap, tripod adapter and carry bag in the package. With the inclusion of the case (which can be used with or without the lenses attached), the Klyp+ offers good value. Reviews suggest the best lens by far is the portrait version—it could easily become an everyday shooting option. The fisheye and wide-angle offer useful flexibility, but the image quality isn't quite as good. Much like the OlloClip version, the Moment telephoto lens offers a 2x optical zoom for better portrait shots. It takes a different approach when it comes to attaching it, however—you specify a mounting plate for various iPhone, iPad and Android devices at time of purchase, which sticks to the phone via an adhesive backing. If you're not a fan of that approach, the company has finished a Kickstarter campaign for a dedicated case option instead. The 60mm telephoto lens gets you closer to the action, with a better focal length for getting that much-loved background blur in your portraits. If you're more of a fan of sweeping vistas than close-up shots, the Moment wide-angle lens goes “twice as wide” instead of “twice as far.” This 18mm lens lets you get much more of the scene into each picture, without the letterbox effect you get panorama software. It's definitely useful, but some reviewers have noted a tendency for the corners of the shot to appear darker than usual. You'll likely want to crop the images slightly before using them, if that's a problem for you as well.